Here's a big set of gnomes for you! Our famous lady Zelda, Mordecai the praying gnome, and our most popular Rumple the garden gnome! 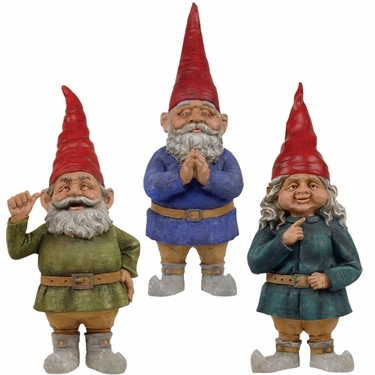 They are the Toad Hollow Gnomes, and we have them in a happy large set of 3. You'll want to take advantage of this garden gnome sale, as we have this whimsical cast of characters at a special low price. Each giant gnome is a whopping 32 inches tall and with uniquely colored clothing and different poses. They'll look fabulous strategically placed around your yard. Place one at the front door, one at the back door, one in the garden, one guarding the patio… you get the idea. Because they're made from cast stone resin that's weather resistant, they'll put up with whatever Mother Nature throws at them. Yes, they're a tough (but friendly) bunch. We have other large gnomes for sale, so browse our pages.